Oasis SS Crewe - Mens is rated 4.8 out of 5 by 13. Rated 5 out of 5 by Tristanbroks from 45km 3 day backpacking trip Wore this shirt as my base layer for 3 days straight on a backpacking trek. Wore it throughout the entire hike from my sleeping bag to the top of a 12000ft mountain, with a variety of weather conditions (rain, heat, cold nights). Shirt held up perfectly and I was hesitant to even have to wash it when i got home as it felt unused still. Fit was exaclty what I wanted, no discomfort. The best base layer I've worn for any expedition. Rated 5 out of 5 by dkwjunk from incredible comfort with soft merino wool while this may appear a bit pricey, the comfort of this shirt is fantastic. Easily fits under any of the shirts i wear to work or play and remains fantastically comfortable. this is the 2nd I purchased and i expect it will last for years...!!! Rated 5 out of 5 by Richy from Wear it everyday I purchased my first icebreaker shirt in downtown Auckland 1998. To this day I've always appreciated their simple design and exceptional quality. There has never been a single Ice Breaker purchase that I haven't been happy with. Rated 5 out of 5 by Pr55 from Perfect t-shirt Very comfortable to wear for just about any activity and also out to a casual meal. Although I am similar size to the medium model on the website, I sized up to a large and it still fits very well and seems to have a bit of extra length to ensure coverage when active. A few of these shirts will easily get you through a week of active travelling without worrying about odours. Rated 5 out of 5 by FraserValley2772 from The best Shirt you will ever own Comfort, moisture wicking, odour free, resilient, great form, this is my favourite T Shirt! My Icebreaker clothing collection continues to grow and the Oasis Crew is the consistent workhorse underneath the layers! Great work Icebreaker! 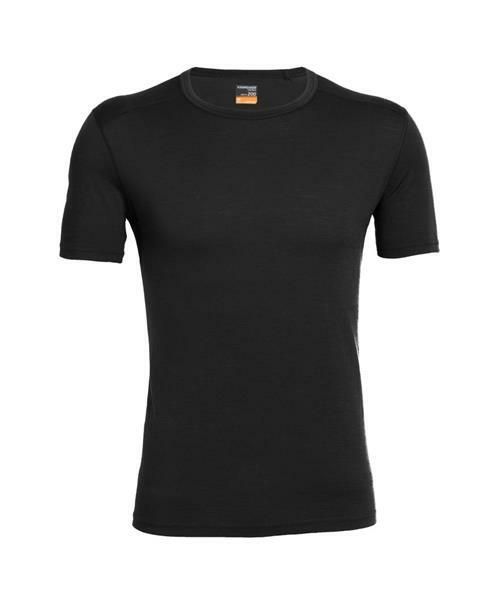 Rated 5 out of 5 by MET56 from Every day weight I have used this T-shirt (or similar prior styles) for many years as a stand alone Tee or base layer for cycling, hiking and skiing in cooler conditions. Excellent moisture wicking and quite durable. Rated 5 out of 5 by Gbuhr from Mr Gerald Buhr I have a dozen shirts from ice breaker. My go to tees winter and summer. In 6 years I have only discard one due to age. Will purchase more.